Amazon is reaching out the The Caribbean with a pilot program first available in St. Kitts & Nevis. 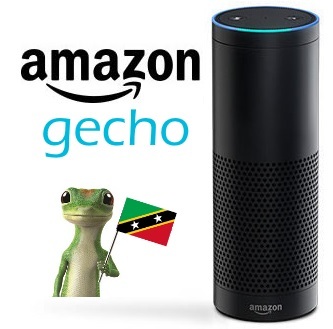 The Amazon GECHO is similar to Amazon’s ECHO but with a Caribbean flair. User: Gecho can you hook me up with some herb? Gecho: Yo, aye sure can! What strain mon? User: I don care Gecho. Gecho: Would you like to save 15% on your next herb delivery in just 5 minutes? User: Not today Gecho…. Jus deliver me some herb and some salt fish please. Gecho: Your delivery is on its way by mongoose courier. Check your window shortly. User: Gecho, Play some rock music. Gecho: I’m sorry Dave, I afraid I can’t do that. I will play some Marley instead. User: Gecho, Traffic report please. Gecho: Traffic is light, but with a heavy dose of bus holes on the road.